Dark Horse have got you the perfect sale for Halloween. 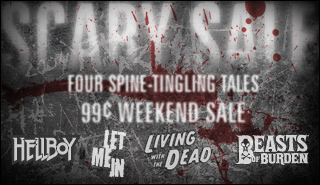 And in honor of our favorite spooky holiday, this weekend we are having aÂ Scary Sale!Â For only 99 cents you can pick up spine-tingling comics fromÂ Hellboy, Let Me In, Living with the Dead,Â andÂ Beasts of Burden!Â Get your scary on starting Friday! There are some excellent titles here so why not check them out?